Canis Root is harvested from small, gnarled bushes. In the Rift, the bushes are found in birch woods near rock formations or at the base of cliffs. They are also found in swampy regions such as Hjaalmarch and along the northern coast of Haafingar. 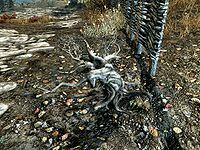 According to the book On Lycanthropy, found in the game Daggerfall, a Skyrim tradition is to rub canis root on trees as a ward against werebears. However, there are no werebears present in Skyrim, perhaps denoting this tradition's success. Neloth is particularly fond of canis root tea, though you cannot actually make tea from canis roots ingame. This page was last modified on 9 April 2018, at 03:40.